No Wonder They Smoked So Much Back Then! Judging by the neat stuff they used to give away with cigarettes, it’s a good thing I wasn’t around during the early thirties, otherwise I might have been lured into that pernicious habit. 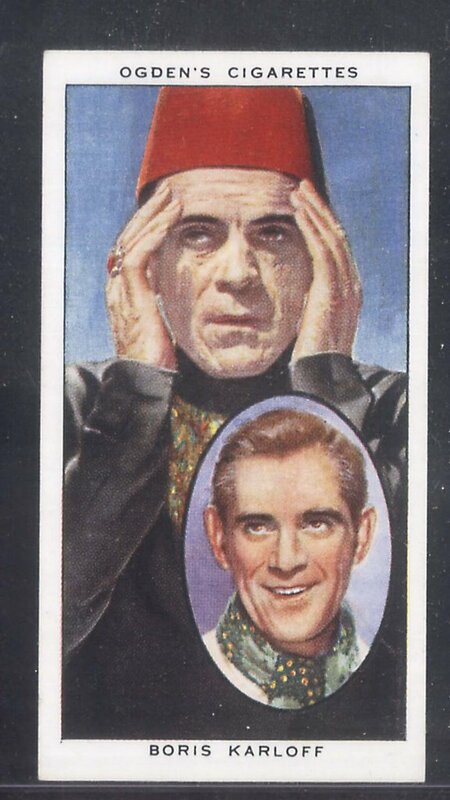 Imagine opening a pack of Ogden’s smokes and finding this fabulous collectable card with Karloff as The Mummy, with that smiling cameo inset of a smiling off-screen Boris. Ogden’s was a branch of the Imperial Tobacco Co., "of Great Britain and Ireland." This itty-bitty Mummy souvenir is only two and a half inches tall and one and a third inches wide! 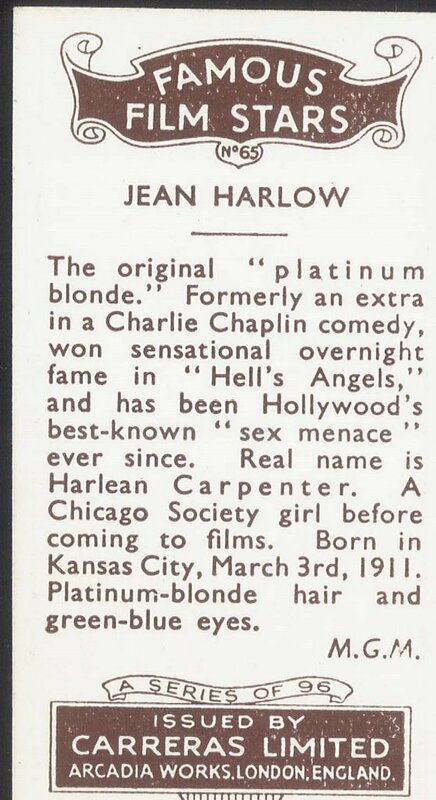 What follows is an excerpt from the biographical notes (!) on the reverse side (and believe me, you need the eyes of a Falcon to read them!) 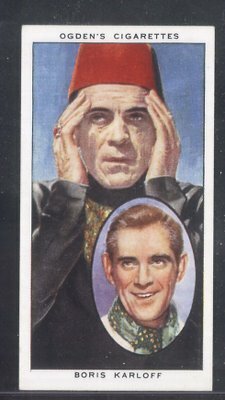 --- "Here is Karloff’s intricate make-up in The Mummy, the detail of which shows how much more thoroughly this sort of thing must be done for the camera than for the footlights." 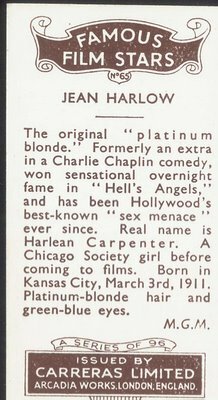 We actually scanned the back of Jean Harlow’s card (wasn’t easy --- hers was even smaller than Karloff’s! ), and as you see, it was part of a series of 96 issued by Carreras Limited (could this be the same Carreras family that later formed Hammer Films?). The Errol Flynn/Olivia DeHavilland pose from Dodge City was part of a series available in both English and South African editions. You could also order a "magnificent book" containing all 132 cards in this group from "Max" Cigarettes. 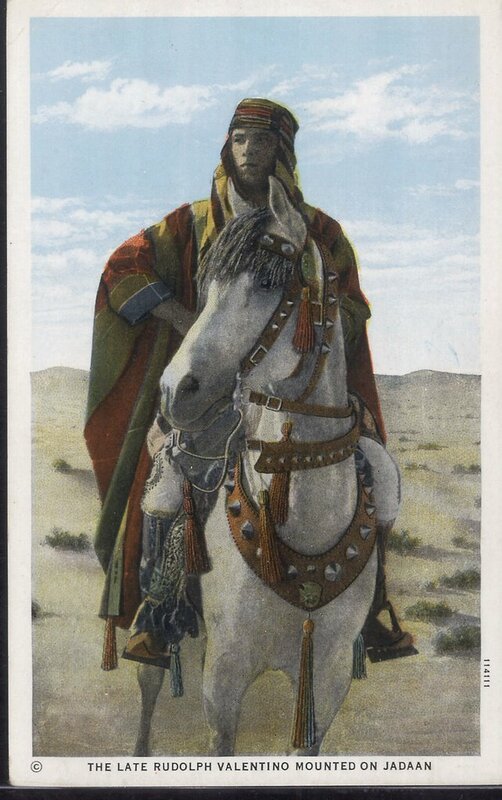 Finally, we have the largest specimen I’ve run across --- a three and a half by five and a half image of "The Late Rudolph Valentino," which was issued as a picture postcard. 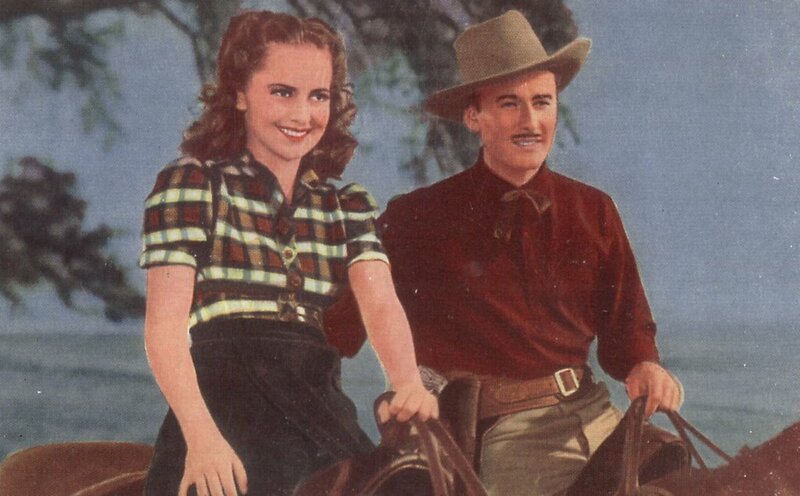 The back caption credits the owner of Rudy’s mount, Jadaan, "the last horse ridden by Valentino" in the actor’s final film, Son Of The Sheik.